DESIGNING POET Proudly offers The PAMI POCKET! A smart, Different and Convenient Way to Carry Your Cellphone! PURRFECTLY PAWFECT for PET LOVERS!!! 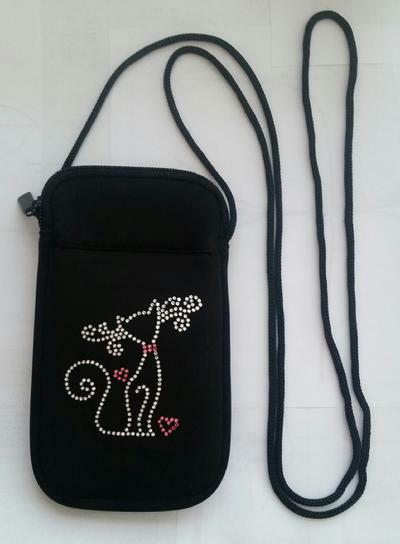 The PAMI POCKET is a stretchy, water-resistant pouch made of cushiony neoprene! 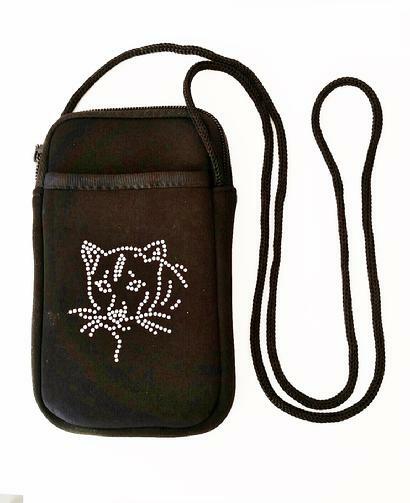 Use it to carry your cell-phone, a small camera, your smart phone, or an i-pod. You can also fit some cash, id, credit cards and even some keys. Whether you're bike riding, at the beach or pool, out dancing, at a theme park, or just shopping, this is a great way to carry your absolute necessities, hands-free and worry-free. PAMI POCKET is 7 1/4" x 4 1/4" and a strap of 54". PAMI POCKET PLUS fits larger phones even with a bulky case. Made with 3mm Water-Resistant Neoprene. It has a front pocket with a Velcro closure to keep credit cards, cash and ID securely. 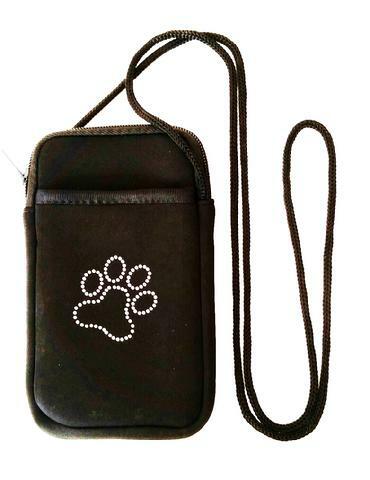 The PAWPRINT and CAT design are tastefully done with Rhinestones. A percentage from Total Sales is donated to Canine and Feline Health Studies. Price $20.00 Florida Residents. Add 7% Sales Tax FREE SHIPPING! Quantity discounts offered for Five (5) or more. Contact me for pricing.